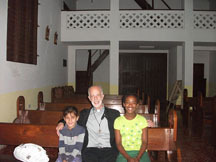 Redemptorist Father Ruskin Piedra recently returned from his annual mission trip to Martí, Cuba, where he and a small group of missionaries distributed needed items to the poor, visited people in their homes, and conducted a parish mission. 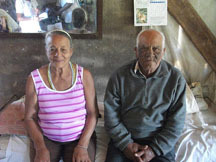 The mission was announced on a Sunday in St. Anthony, a church in Itabo, which belongs to the principal church in Martí, San Jose, at a distance of about 15 minutes by car, and 45 minutes by cart. Each day, morning and evening, the mission team of three or four, together with the cart driver and his obedient horse, went to Itabo. We gave out what little we could obtain in the poorest areas: dry pasta, cubes for soup, soap, powdered juice drinks, sweets for children. In the evening, we had the rosary, Mass and a mission homily. A 9-year-old girl, blessed with a clear strong voice, did one of the readings. Just as well since not all can read, nor are they inspired to, among the poor in Itabo. We were very satisfied with the turnout, which, though not numerous, were very faithful and enthusiastic. I noticed in this area there is less to eat and less clothing available. At times even essentials for personal cleanliness are wanting, such as bathroom tissue, toothbrushes, etc. Sometimes, if the item is not available in one store, you may find it in another, if you don’t tire of searching. When something special, like fish or meat, arrives, word spreads quickly and people run to get on line. In no time, the specialties are gone. 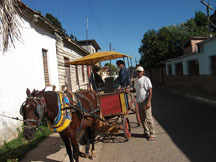 But the Cuban spirit is invincible: you can see kiosks rising up here and there in front of dwellings with three malangas (a vegetable), four sweet potatoes, bananas, some mangoes and such like. Very little but it’s their very own. Of course, a portion of their intake goes to the government. Nonetheless there were unforgettable moments, like the lady in a very poor shack who showed us on the wall a coffee grinder from the 1800s, handed down from her great-grandparents. From her own mini coffee plantation, she took the beans that had dried out in the back yard, threw them in the coffee grinder, and put the ground coffee into a large stocking, which she then brewed. While we awaited the coffee, she served us marmalade from oranges grown in the back yard with a white cheese made at home. They may be living below the poverty level but to me they were rich in other ways.